I think it's safe to say the Blues Rock scene is in a very healthy state at the moment. History will tell you that out of the two sexes, it's the men who have always dined at the top table as far as worldwide recognition goes. However, in recent years, there's been a massively encouraging blossoming of top quality female artists. Acts like Beth Hart, Joanne Shaw Taylor, Heather Gillis and Ana Popovic (to name a very select few) are without a doubt nailed on to have their names forever etched in the genre's history. If you purchased Jennifer Lyn's 2016 debut album 'I'm All Wrong For You Baby' you may have been inclined to think the same. 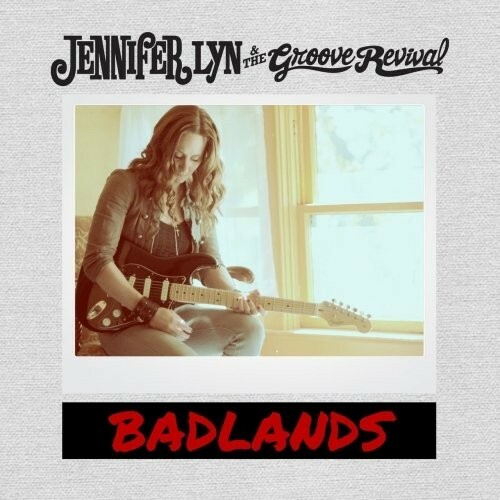 With sophomore release 'Badlands', the Minnesota native, along with her band The Groove Revival, have seen their inaugural offering and monumentally raised it. Once again, they've stuck with producer Richard Torrance who has manicured a hearty Blues Rock album that's gleaming with gems. If you are hearing Lyn for the first time, the refined rhythm of opener 'Burned It Down' serves as the perfect hors-d'oeuvre for the sumptuous banquet that lies ahead. This tune's flowing quality brings to life all the elements that make Lyn such an enduring prospect, like the classy rasp of her vocals and the enduring simplicity of her guitar playing. The same vibe extends to the title track which stomps along nicely with an elegant funky riff. 'Muddy Water' heads down a slight Gospel/Bluegrass route with generous helpings of old-school slide before she unleashes her inner rocker with the hard-nosed 'Anything But Me'. It's soon back to mainstream Blues for 'I'm Running To You' and 'West To Bismarck', and these two tracks once again highlight her imposing and distinctive vocal delivery. Closer 'Goodnight Sweet Darling' took me straight back to that classic early Heart sound with its acoustic-led, mystical gypsy vibe. It's hands down the crowning glory on one of the most honest albums you'll hear this year.